Every great New Year's Eve celebration begins with great food. Add in people you love and fun games...and you've got a perfect way to ring in the new year! Part of our menu almost always includes our favorite dips. What's more fun than a Dip Buffet, right? Tonight, we'll be serving four of our favorites. Guacamole- Most people I know who LOVE Guacamole, make it their own special way. But if you're interested in how I make mine....I like it with lots of fresh garlic, Kosher salt, a little pepper, a squeeze of lemon or lime juice, and a little Cayenne. Sometimes, I will toss in a very fine dice of tomato, red onion, and jalapeno if I'm in the mood. Tonight, I'll keep it simple! 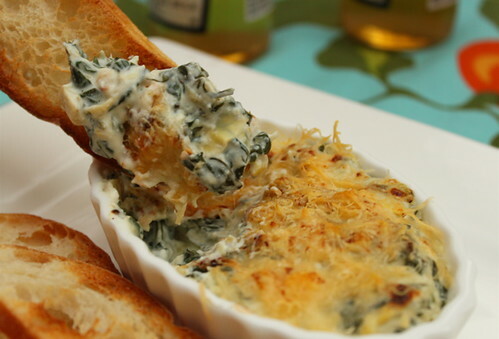 Boil spinach and artichoke in one cup of water until tender. Drain. Add in cream cheese, stirring until melted. Add rest of ingredients. Pour into a square or oval baking dish. I like to add a little more Parmesan on top. Place under broiler for a few minutes until hot and the cheese is a light golden brown. This is best served with Baguette slices that have been buttered and browned slightly under the broiler. YUM-O! If you don't have a Baguette loaf lying around, tortilla chip will do also! We usually make homemade salsa as well, but not tonight. I'll share the recipe in a future post. So, what yummy snacks are on your New Year's Eve menu? Please share!